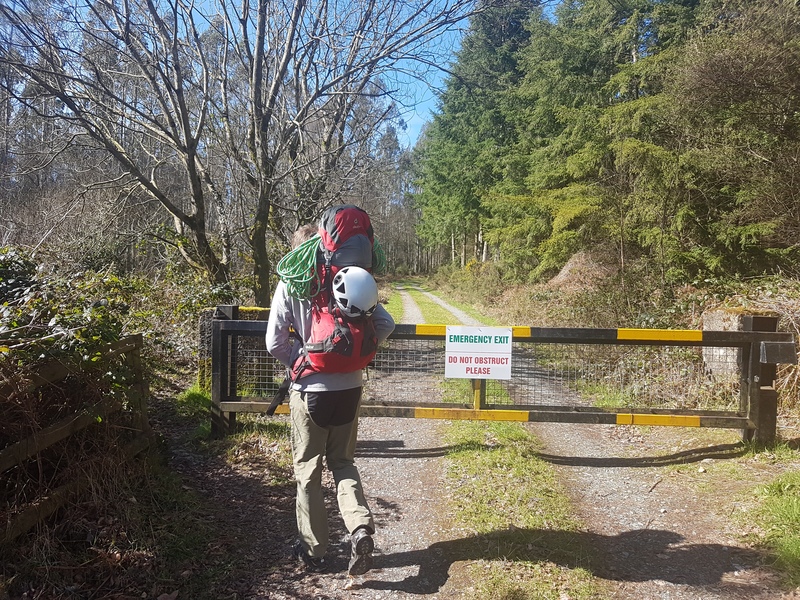 When Diarmuid messaged me up yesterday to see what I was up to for the weekend I immediately knew there is an adventure on the horizon! He isn’t a type of person that wasts words on chit-chats. With weather shaping up to be in mid teens both Sat & Sun it was just matter of picking a destination. He suggested a small trad crag in Wicklow called Barnbawn. 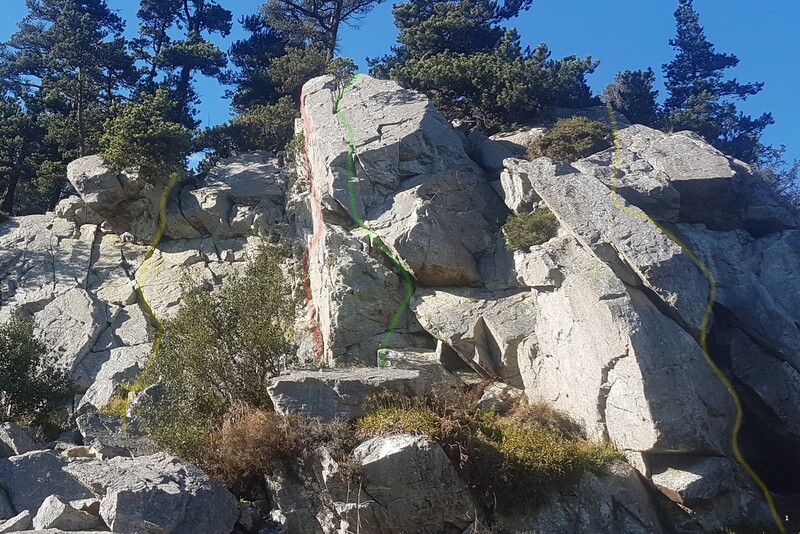 According to the guidebook it is “Sheltered, sun-catching, quick-drying and low-lying, this crag has routes ranging from Diff. to E1. All this and only 15 minutes from the road. Not being a mountain crag a visit at any time of the year is feasible”. I actually never been there before, so it was an easy call. We showed up relatively late (to make sure the sun is high up on the sky) and started the short approach. After some 20 mins walk in a nice sunny weather we showed up at the bottom of the rock. It’s not impressive by any means, but good enough for 1/2 day climbing. Quick look into the guidebook and we identified our picks. The goal was to at least do * marked ones in VS range. I marked them on the picture above. Diarmuid picked the first, warmup one, marked yellow, right side of the picture. “Start at the foot of the chimney. Struggle up the chimney to where it widens below the overhang. Move left up a slab and pull around the overhang at its left edge. Climb up the slab to a belay.” – description says ‘struggle up the chimney’ – it really IS awkward! D getting into the chimney of Swing Lowe. LINEKER * 13m VS (4b) – Yellow, most left of the picture. “This climb take the slightly overhanging crack running up the righthand side of the nose. 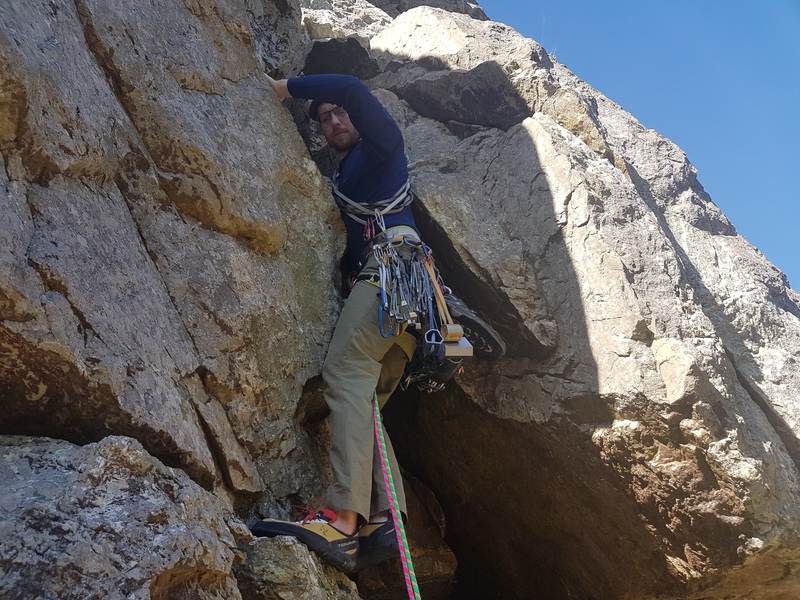 Climb directly to the start of the crack, which is climbed, with a move left to finish.” – It is really a 1 move wonder, although a very interesting one, pulling up on very overhanging bit right of the nose. BONSAI * 16m VS (4c) – Green, middle right. “Start at the foot of the right-hand edge of the wall, just down from Saw Doctors. 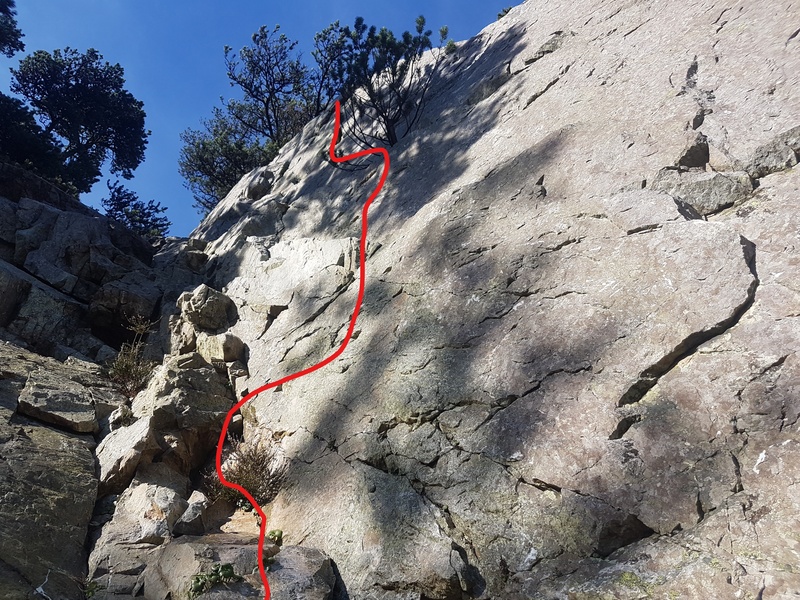 Climb the edge of the steep wall on good holds and gain the upper slab near its lowest point (a runner here will protect the second from a possible big swing). From the slab follow the narrow crack, passing the tree with care.” – The crux is definitely getting to the tree – the holds are there, but one have to really commit to get to them. THE SAW DOCTORS * 15m VS (4c) – Red, middle left. “Start as for An Grianán. Climb the first 3m of the corner to the top of the block, below a sloping ledge on the wall. Pull up onto the ledge and then make awkward moves straight up to a higher ledge. From here continue up the steep wall above, finishing at the highest point of the wall. Small wires useful for protection.” – probably the best climb of the day. I have a feeling i might have gone a bit more than 3m of the corner. Still good moves on small gear. Looking up The Saw Doctors – probably the best route of the day. Unfortunately for the blog, Diarmuid isn’t really a camera carrying type, so there aren’t many more shots (also with a team of 2 it’s rather difficult to take good shots from proper angles). Looks like the weather will hold up tomorrow through entire Leinster province, hence we are planning a trip to Ballykeefe Quarry in Kilkenny. A very rare occasion of outdoors bolt clipping in Ireland!